What's not to love about the young royals? 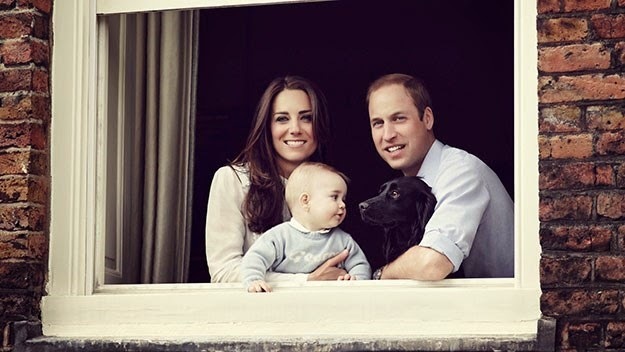 In a new photo just released (photo: ©Jason Bell/Camera Press/Austral) the royal couple show their adorable little family, which includes their eight month old son Prince George and dog Lupo (which means 'wolf' in Italian! Love that). Let's take a moment to look at the unbearable cuteness of George. The royal couple are currently preparing for little George’s first official trip and first public tour to Australia and New Zealand in April. The Duke and Duchess revealed in early March that they would be taking their son with them on the trip because they simply could not be away from their first born "for so long". "It's a tremendously exciting visit and I can tell you Their Royal Highnesses are looking forward to it immensely," Prince William’s private secretary, Miguel Head said at a media briefing at Kensington Palace. The young royals' three week trip will see William and Catherine visit 13 major cities with Prince George's new Spanish nanny Maria Teresa Turrion Borrallo accompanying them. The royal couple will arrive in Australia on April 16. Will you go see the royals when they come to town?